After 20 years of programming, what code do I find to be most useful? I've found many of my applications do have a lot of code in common - user interface, file access, internet /email functions, etc. - whereas the balance of the code is unique to the application. Here's my suggestions for the Top 100 code snippets in each language, or groups of languages. I welcome any suggestions for additions to these lists. Throughout my site I promote the use of gbCodeLib, my multi-language freeware code librarian. 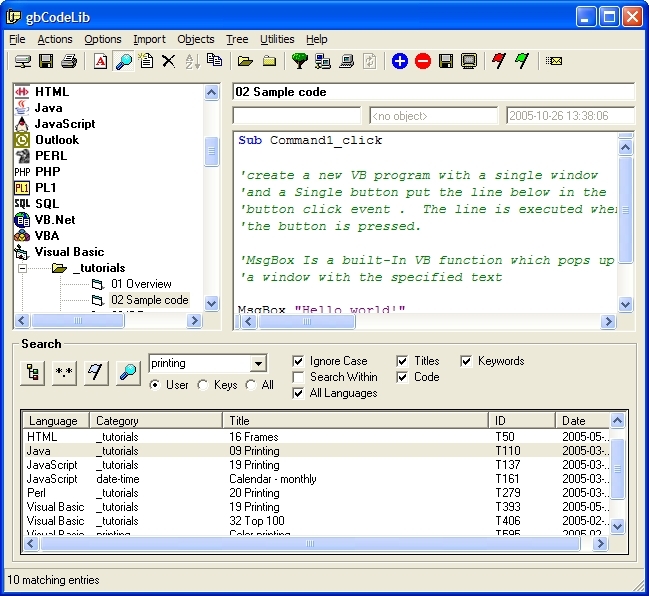 gbCodeLib has an easy-to-use interface and provides one of the largest feature sets of any code librarian available today. Over 1000 sample source code snippets from fourteen languages, including language mini-tutorials, are included in gbCodeLib - including the Top 100 Code Snippets all programmers should know! If gbCodeLib doesn't meet your needs, you might want to take a look at a review of available code librarians that I completed a while back.